Christian children's series for ages 8-12. DVD extras include a half-hour abridged documentary on Carmichael, and a discussion guide. The Torchlighters animated series highlights Christians who have been faithful to Christ in the midst of opposition and hardships. It is targeted at an audience of 8-12 year olds. 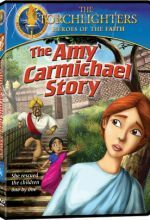 Amy Carmichael was an Irish missionary who served in Indian in the early 1900s. Amy was criticized for shedding her western clothing for an Indian sari. However, as the episode pointed out, this enabled her to blend in with the native people when she rescued children from the Hindu temples. Preena was a young gift whose father died when she was still a young girl. Her mother is then faced with a tough decision. Without a husband to provide an income for the family, Preena;s mother decides to give her daughter to the temple to be raise there where she would serve in the temple in various capacities. The woman teacher at the temple is not at all nice to the girls who are under her care. Essentially the girls are treated as prisoners. Preena makes various escape attempts. During one such attempt, the girls meets Amy. She is so struck by Amy's tenderness. Realizing that Amy is a Christian, Preena prays to God for release from her circumstance. Eventually she is able to escape again and makes her way to Amy's home. 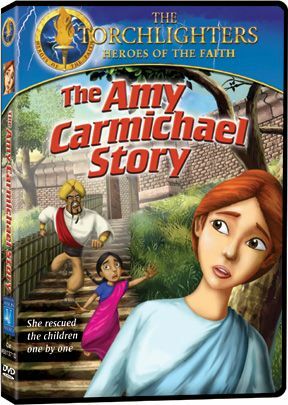 Amy takes her in, and when she learns about the treatment the girls endure at the temple, she feels called to rescue the other children from the temple. The presentation of Amy and Preena's story is very powerful. The various abuses the girls endure at the temple are glossed over by the documentary in the extra features in the DVD notes that for some of the temples the children are used as prostitutes. For this reason, the documentary is aimed at a more mature audience that the episode. The story has a run time of about 30 minutes. The DVD features English and Spanish spoken languages as well as subtitles in both languages. Lesson plans and leaders guides are on the DVD. A 30 minute documentary which is an abridged version of "Amy Carmichael: Mother to the Motherless" is included in the bonus features. This extra targeted at an older audience of 12-18 year olds. This story tells of little Preena, snatched away from the most gentle woman she has seen in months, wondering how she'll ever again find a way out of the temple where she's held against her will. How will she find the missionary known as Amy Carmichael, the one who wears a cross and serves a different sort of God? This story touches my children ages 5, 11 and 12 when they watch it. I would recommend it to anyone. I was flipping through Christian programming when I stumbled across The Amy Carmichael Story….Tuning in a bit late, I was curious as to what the story was about and so decided to watch more of it. I ended up watching it to the end, as did my wife. I became rather teary-eyed at certain points in the story…. I didn't think I could ever be so affected by an animation. Bringing these stories to life is an incredible service to the church. I find myself wondering why I don't recall ever hearing of these three heroes of the faith that Torchlighters brings honor to. Thank you.